Character Types Round Character: A character with multiple personality traits who experiences changes during the course of the plot. Round Character: A. 2 Character Types Flat Character: A character that is not well developed, usually with one personality trait featured. This character has a major role in the plot. 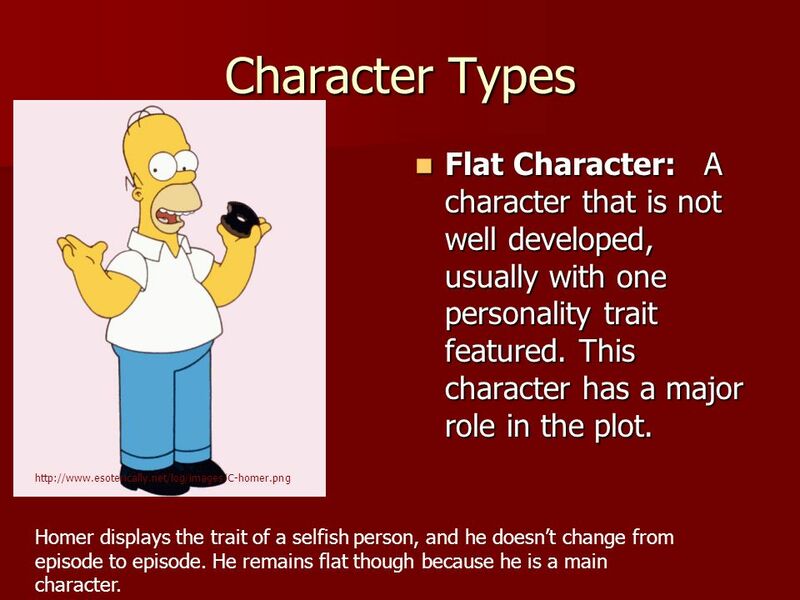 Flat Character: A character that is not well developed, usually with one personality trait featured. This character has a major role in the plot. http://www.esoterically.net/log/images/C-homer.png Homer displays the trait of a selfish person, and he doesnt change from episode to episode. He remains flat though because he is a main character. 3 Character Types Static Character: One who does not change in the course of the story and who exhibits one personality trait. 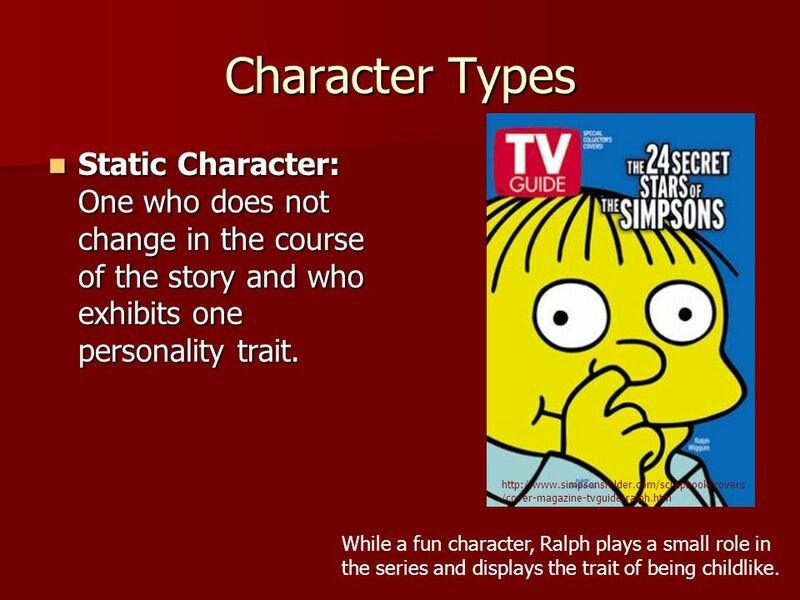 Static Character: One who does not change in the course of the story and who exhibits one personality trait. http://www.simpsonsfolder.com/scrapbook/covers /cover-magazine-tvguide-ralph.htm While a fun character, Ralph plays a small role in the series and displays the trait of being childlike. 4 Character Types Stereotype Character: Character who possesses expected traits of a group rather than one trait, as a static character would. Also known as a Stock Character. 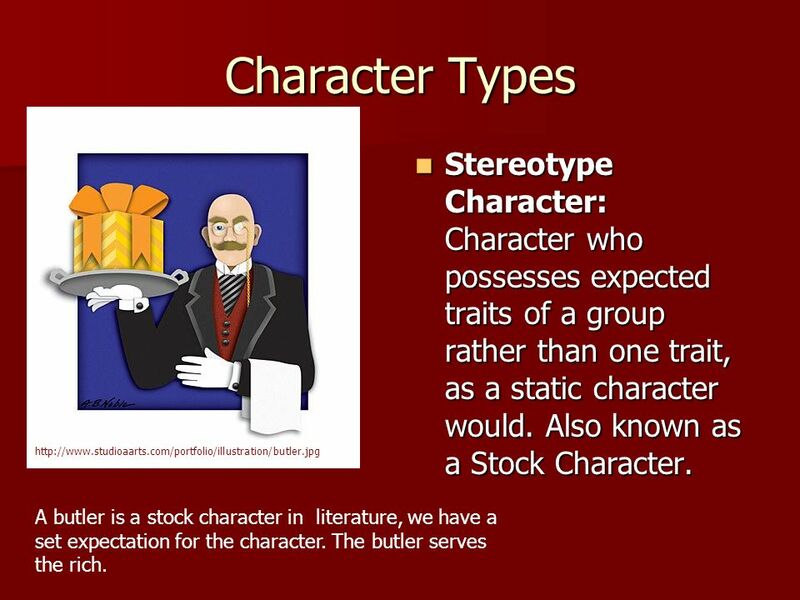 Stereotype Character: Character who possesses expected traits of a group rather than one trait, as a static character would. Also known as a Stock Character. http://www.studioaarts.com/portfolio/illustration/butler.jpg A butler is a stock character in literature, we have a set expectation for the character. The butler serves the rich. 5 Character Types Foil: A character whose traits contrast with and point up the traits of a central character. Foil: A character whose traits contrast with and point up the traits of a central character. http://www.cnn.com/2003/SHO WBIZ/books/12/11/review.mytho logy/story.batman.jpg http://www.jgmodels.co.uk/images_ 2005/Superheros/Large/kneeling%2 0joker.jpg The Joker foils Batman. He is so evil, that he makes Batman look good. 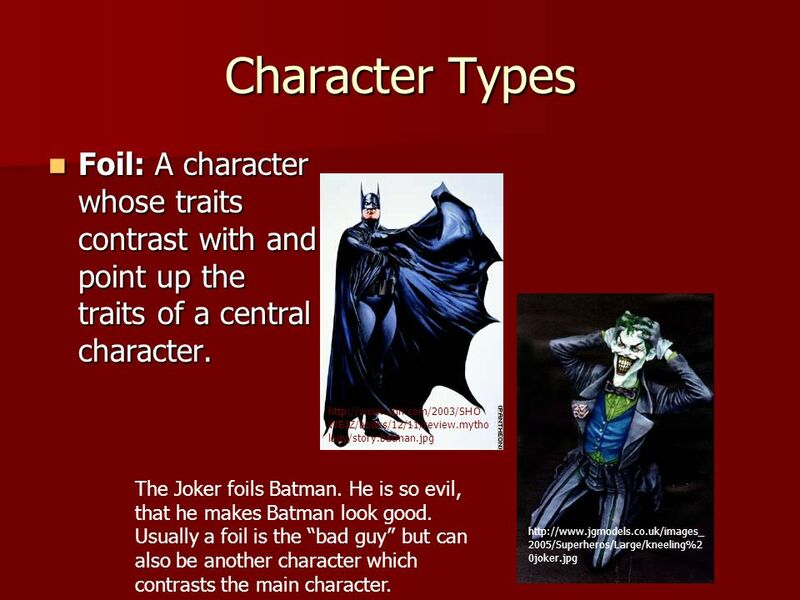 Usually a foil is the bad guy but can also be another character which contrasts the main character. 6 Character Types Archetype: A character that has symbolic meaning because the characters traits are easily recognizable and common to the human experience. Archetype: A character that has symbolic meaning because the characters traits are easily recognizable and common to the human experience. http://erniejr.8k.com/oz/wiz_c036a.jpg The Wizard in The Wizard of Oz is symbolic of leaders who struggle in their role in times of trouble. 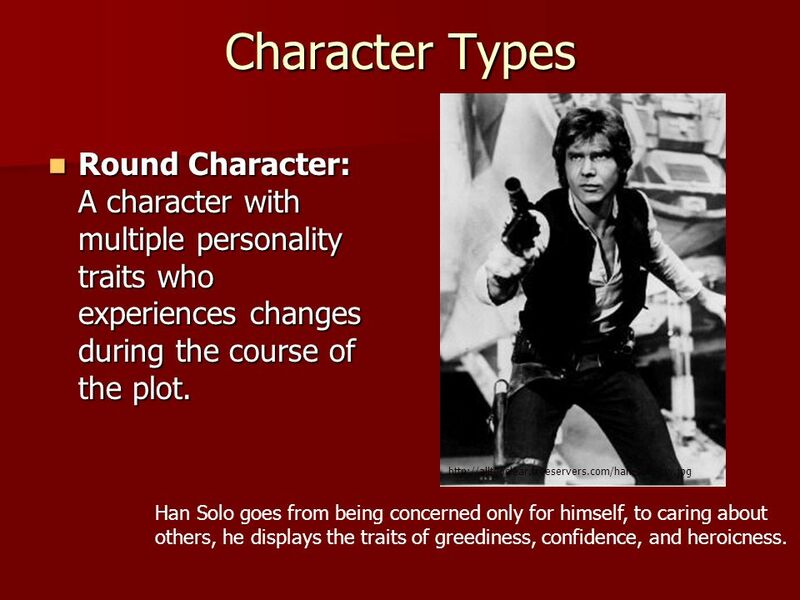 Download ppt "Character Types Round Character: A character with multiple personality traits who experiences changes during the course of the plot. Round Character: A." Character Types. 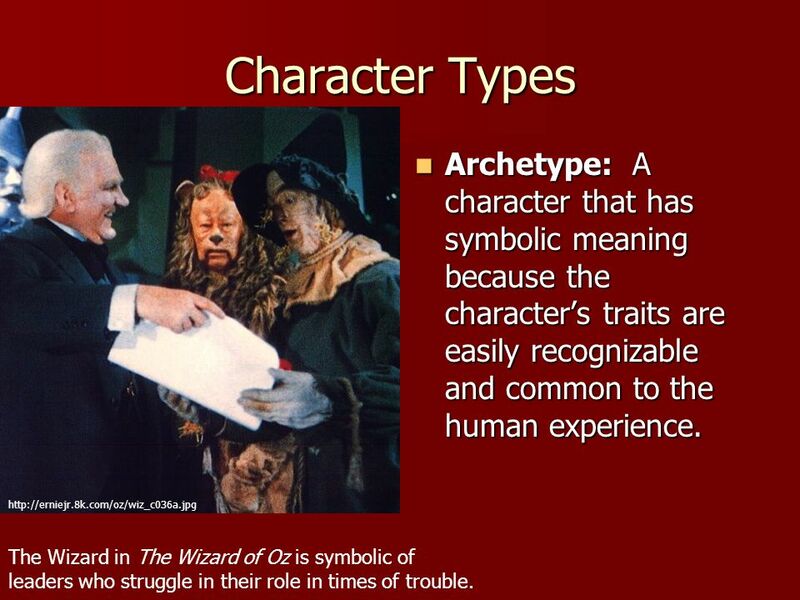 Introduction O This lesson is about the different types of characters found in literature. The different types I will cover in this lesson. A round character is a major character in a work of fiction who encounters conflict and is changed by it. Round characters tend to be more fully developed. An imagined person who inhabits a story..  Stereotyped characters known for some outstanding trait or traits ( Prince Charming, the mad scientist or. Relationships and Conflicts Character Interactions. The characters are the people and/or animals in a story.  The protagonist is the main character. They aren’t always the “good guy.”  The antagonist. Characterization: the act of creating and developing a character. Agenda ELA 9 October 27 th, 2014  Independent reading  Mini lesson on Character  Introduce storyboard assignment  Work on Denouement writing piece. Characters What are characters? Why are they important to stories? Character in Fiction. Definition Characters: the people in the story Characters: the people in the story Characterization: the process by which the writer. Protagonist/Antagonist To make it easy, think of the protagonist as the “good guy” and antagonist as the "bad guy." You can think of the protagonist as. I DENTIFYING A RCHETYPES AND C HARACTERS IN L ITERATURE. Character Types The following terms can be used to discuss characters in a poem, story, or drama. Identifying the Elements of Literature: Character Student Notes English I Mrs. Nagy. Characterization  Literary characters are those creations that permit artists to play deity – to populate a fictional universe with people and creatures.